On Sunday, Joey Logano and Kyle Busch made contact at Las Vegas Motor Speedway. They were racing inside the top 5 on the final corner of the Monster Energy NASCAR Cup Series event. It resulted in Kyle Busch sliding down pit road and across the start finish line. 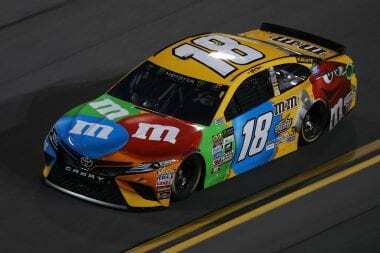 Kyle Busch, the Joe Gibbs Racing driver of the #18, then exited his car and took off in search of Joey Logano. When he found him, he threw a punch at the Team Penske driver. That punch was thrown without a word spoken about the on-track incident. Or any words spoken at all. Tuesday, Joey Logano made a phone call to Kyle Busch to discuss everything that happened in Las Vegas. This is a change to previous incidents involving Joey Logano. In the past, he wouldn’t call drivers following track incidents. He’s since learned from his mistakes. He continued, “We’re going to have two sides to the story like there is all the time, but really the bottom line is we’re two passionate race car drivers. We’re two of the best in the sport that are going to go for wins that are aggressive and we collided. “That’s the part that’s tough, because it’s going to happen. You want to get through it as quick as you can and talk it out, but bottom line is it wasn’t intentional and we’re going to have to work through it somehow. We’ve been racing against each other for nine years. We’ve never had a problem. We’ve been teammates and we’ve known each other really well. I consider him a friend of mine. Joey Logano has learned from his mistakes. In the past, he didn’t make this type of phone call to competitors. Most notably, the Matt Kenseth incident in Kansas that later caused insanity at Martinsville. That was something that could have been avoided had he made a phone call or handled the post race interviews differently.